I have spoken with over 1,000 Founders in the last 5 years and heard even more pitches. My job is to spend time with some of the most driven, creative people in the world. I have walked alongside startups as they formed and reformed their idea, built their first deck, launched their product, scored their first customer, shut down their company, sold their company, grew their company, and pivoted, and then pivoted again. From the highest highs to the lowest lows, I have seen it all firsthand. And while each Founder and story is unique, almost all first time entrepreneurs building and launching software think money is THE answer. But my experience (and that of others much smarter than me) will tell you, it’s probably not the solution you hope it to be, especially not in the very beginning. 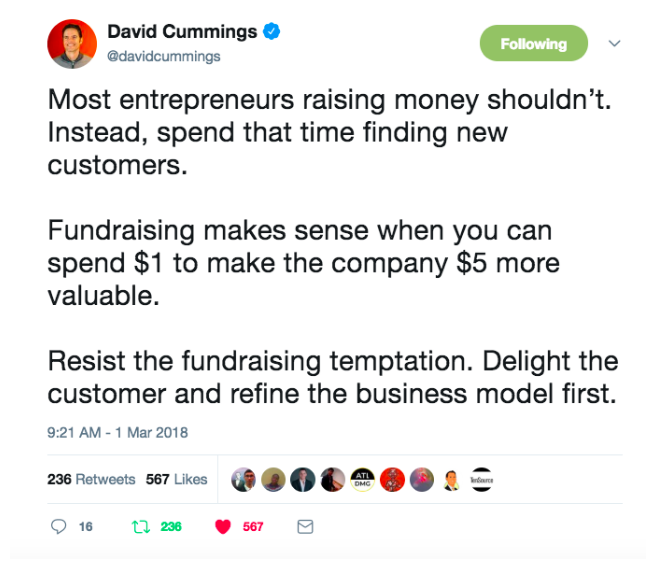 Funding is incredibly misunderstood, perhaps more than anything else (other than the importance of Customer Discovery but, we will leave that for another day). So today I am going to give you the cliff notes version of funding for startups. Read it, learn it, share it. It may save an entrepreneur. First things, first. Say this with me: “All great ideas will NOT make money.” You may need to repeat that. Unfortunately, it’s true. Great ideas do not always equal paying customers and/or product/market fit. There is a reason startups are hard. So if your great idea isn’t set up to be a viable business that will scale, funding is not on the table. Period. Have that sinking feeling in your stomach that this is you? Totally okay. It doesn’t mean you shouldn’t pursue it! It just means you need to adjust your “why” and settle in with new lifestyle goals to follow your passion. Now, think you have that viable business? Take a look at that awesome one page strategic plan you made. (If you don’t have one, go make one and then come back). When you review your goals 3, 5, or even 7 years out – what do you see? What would satisfy you most? I usually recommend identifying your endgame and working backwards. If you want a lifestyle business, that’s awesome! There are tons of very successful, wealthy people who run lifestyle businesses. You just shouldn’t seek funding. Most investors aren’t going for dividend checks. They want that exit. But if your dream is an IPO or acquisition, sit back and get ready for a crazy ride, because funding may well be in your future. This is all you, my friend. Putting the work in, cranking it out, and hustling hard. You aren’t waiting for a paycheck to make your idea happen. You are making major sacrifices to build your dream. You are the marketing, the sales, the builder, and the visionary. And that work, stress, debt, and time and effort is your (and your team’s) sweat equity. It gets you a lot further than you may think, if you want it bad enough. Most investors prefer a Founder who is willing to go all in with sweat equity first. It says a lot about your resilience and drive to build something great. A lot of folks think this is the same as sweat equity, but it’s not. They often just go hand in hand. If sweat equity is using your time and talent to build, bootstrapping is finding creative ways to bring in resources and money as you build. You have outside help, but not from investors. Many technical Founders will build software for other people while they build their own. Consulting is common, so is selling your car, downsizing your house, getting another job, or even landing a customer who will pay you to build your product. It can look a lot of different ways, but bootstrapping means being incredibly resourceful with who you know and what you have to make it work. This is just like it sounds. Hit up your friends and family and ask them to loan you money. They aren’t accredited investors or official angels, so they may not know what they are getting into. They are people who love and support you and have some extra cash. Getting money this way can be ROUGH on relationships. 70% of startups fail, and not paying folks back is a tough situation. Make sure you are clear and upfront about the high risk of this investment. I have seen Friends and Family rounds that are $25k all the way to $500k. It all depends on who you know. Angels invest in startups that are typically less than 3 years old, have very little traction, and are still trying to find product/market fit. They are called “Angels” because they are the investors who come alongside a Founder in their hour of need, when most people don’t believe in them yet. At this point in the game, it’s less about the data, and more about the Founder, the story, and the vision for the product. And while it is sometimes possible to get Angel investing pre-product, it’s rare and usually reserved for serial entrepreneurs who have had previous successes. These rounds are generally between $300,000 – $2M. A good rule of thumb is to try and raise an angel round after you have a built your product (even if it’s just an MVP), have a skilled team that is more than one person strong (most Angels prefer two Co-Founders with complementary skill sets), and perhaps the most important – viral, organic growth and/or active, paying customers. Angels don’t expect your story or product to be complete at such an early stage and as accredited investors they know it is high risk. If you can land an Angel round, you are officially in a binding relationship, have given up a portion of equity, and need to put reporting structures in place because, accountability. But, those early investors will be your biggest supporters and allies as you grow and scale. This is the big guns and usually starts with a Series A for raises of $2M+ (East Coast) and $5M+ (West Coast). Raising VC immediately changes expectations. You can no longer do what you want, and investment is no longer about the story, but about the data. A Series A is very metric driven. Know your market, know your competition. If you think there isn’t a competitor, you either don’t know about them, or it’s a red flag because there is a reason others aren’t in the space. Strong team, great market opportunity, and a compelling solution. Evidence of product market fit and an MVP. Initial traction, customers who are fans, and ready to scale sales. Strong growth and increasing market share. The more of these you have, the easier it is to raise. While everyone has different opinions, mine is that you should build your product and find some paying customers before seeking funding. Some of the brightest minds consistently encourage Founders to think of funding as the accelerant to their growth, not the solution. Can you get funding without a product? Sometimes. But it’s rare and it doesn’t necessarily mean you should. Money can’t solve a lack of product/market fit. The best source of funding is actually paying customers. And the more a Founder builds their company before investment, the higher the valuation is, which means more money in a Founder’s pocket and better returns for your investors. Go lean to product market fit and then raise money to accelerate growth. More opportunities will open up to you. Originally posted on Atlanta Tech Village Blog.